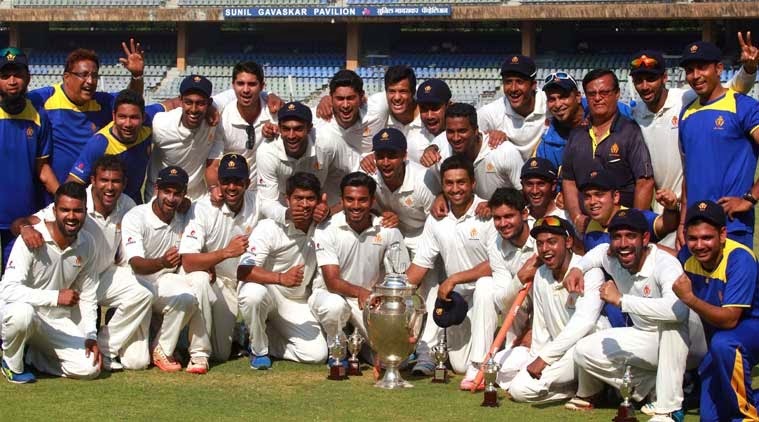 --> Karnataka scored a resounding victory — by an innings and 217 runs — over Tamil Nadu to retain the Ranji Trophy on 12 March 2015. --> This is Karnataka's eighth Ranji title. --> The man of the match was Karnataka’s Karun Nair who had scored 338 runs. --> R Vinay Kumar was the captain of the Karnataka Team. --> Ananth Kumar, Union Minister of Chemicals and Fertilizers launched Pharma Jan Samadhan Scheme on March 12, 2015. --> State Minister for Chemicals and Fertilizers Hansraj Gangaram Ahir and the Secretary, Department of Pharmaceuticals Dr. V.K. Subburaj were also present during the event. --> Pharma Jan Samadhan Scheme is a web enabled system. --> The scheme has been launched to address the grievances of consumers (related to the prices of drugs and the availability of medicines). --> The scheme has been created by the National Pharmaceutical Pricing Authority (NPPA). --> Shri Bandaru Dattatreya, the Minister of State for Labour and Employment (Independent Charge) has launched EPFO's Short Code SMS services for the members of EPFO during the 206th meeting of CBT(EPF) held on 11.03.2015. --> This facility is envisaged to ease the members in knowing their details along with contribution and PF Balance. --> As this facility is available only to the UAN activated members, such facility will speed up the UAN activation process by the members. --> During the year 2014, EPFO had launched the UAN programme wherein a Universal Account Number was allotted to all the members and different services such as passbook, monthly SMS of contributions were provided on its activation at EPFO's UAN portal. --> Parliament has passed Insurance Laws (Amendment) Bill, 2015. --> The controversial Insurance Laws (Amendment) Bill, 2015, which replaced an ordinance promulgated in December last, was passed by voice vote after walkout by Trinamool Congress and DMK. --> The amendment bill hikes Foreign Direct Investment (FDI) cap in the insurance sector to 49 percent from present 26 percent. --> N. Sakthan of the Congress has been elected Speaker of the Kerala Legislative Assembly on 12 March 2015. --> Mr. Sakthan defeated his rival P. Aysha Potty of the CPI(M) by 74 to 66 votes. --> He replaces G. Karthikeyan, who died on March 7. Mr. Sakthan was Deputy Speaker of the Assembly and had resigned the post to take up the new assignment. --> An India-built naval patrol vessel for Mauritius that will help in better policing its vast exclusive economic zone was commissioned on 12 March 2015 by Prime Minister Narendra Modi who said it will make the Indian Ocean "more safer and secure". --> 'Barracuda' which has automatic 30 mm Rapid Fire Gun and 12.7 mm Heavy Machine Guns as part of its ammunition was handed over to Mauritius in December 2014 by Kolkata-based Garden Reach Shipbuilders and Engineers Ltd (GRSE). --> World Kidney Day is observed on Second Thursday of March every year. --> The day is observed to create an awareness among the people globally, about the importance of the kidneys and also to reduce the frequency and impact of kidney disease and its associated health issues. --> The theme for 2015 World Kidney Day is Kidney Health For All. --> Prime Minister Narendra Modi was the chief guest at Mauritius’ 47th National Day celebrations on 12 March 2015 where Indian navy helicopters were part of the impressive parade. --> Modi, who arrived in Mauritius as part of his three- nation tour of Indian Ocean countries, was welcomed by his Mauritian counterpart Anerood Jugnauth at Champs de Mars. --> Mauritius President Rajkeswur Purryag also attended the event.